Do you have a Cute Kid? If so, check out TheCuteKid.com. Not only can you win money, but the CuteKid™ contest provides a great service to many Talent Agents and Entertainment Professionals who continually seek fresh faces. In addition to the contest they're are several free offers and discounts available to entrants. Check out 58Coupons.com for all the best discounts, coupons and offers. Save $5 at The Cute Kid when you use this code. Click link to get started. Follow this link to sign up with The Cute Kid today and enjoy a free one year subscription to Parents Magazine. When you enter the contest on TheCuteKid.com, you'll get a Free 11 x 14 (valued at $67) canvas portrait. Give your child a financial advantage for life with the Gerber Life Grow-Up Plan®, and receive a Child Safety ID Kit. 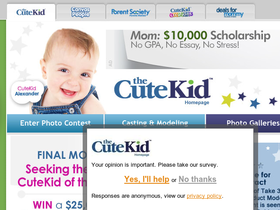 Enter the cute kid contest on TheCuteKid.com and you can win $25,000 for college. Click link to get started.